This package perfectly matches an Onkyo AV receiver with 5.1.2 channel Dolby Atmos speakers for an incredible movie night experience. 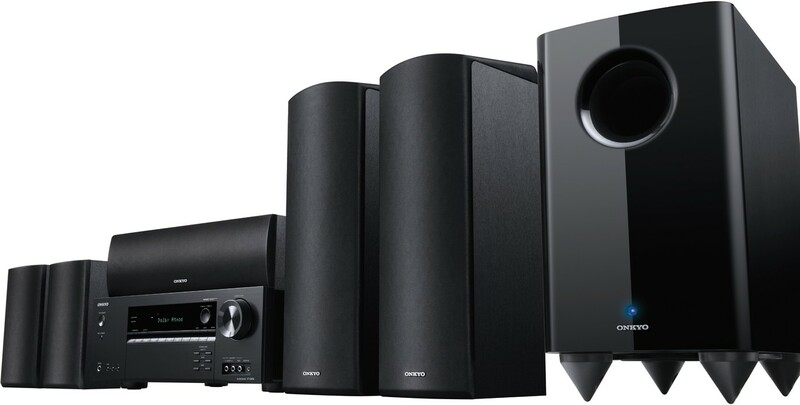 Onkyo HT-S5805 is a 5.1.2 channel Dolby Atmos supporting home cinema package, combining a matching AV receiver and compact but powerful speakers. The HT-S5805 connects all your media players and transmits video to your screen via a single HDMI cable. The 100 watt per channel AV receiver, it can provide full smart TV capabilities by plugging a media streaming stick into the rear STRM Box port. Connect the speaker system for multidimensional Atmos sound that flows above and around you, with AccuEQ technology that optimizes the sound to suit the shape of your room. Bluetooth capability lets you stream audio with Onkyo’s legendary clarity and dynamism. Dolby Atmos immerses you into an astonishing surround sound involvement with charismatic multi-dimensional audio substances that pack in to your room and float all around you. The 7.1 channel receiver can be used to produce a 5.1.2 Atmos speaker arrangement comprising typical 5.1 surround formation alongside dual height channels from within the front channel speakers. With 70 years of industry experience under their belt, you can be sure Onkyo has accumulated vast expertise in building extraordinary sounding speakers. The incorporated speaker package utilises exact drivers encased in solid cabinets - the front of the speakers also accommodates up-firing altitude drivers that unleash the thrill of Dolby Atmos. All HDMI terminals back the newest TV AV displays and HDCP 2.2 reproduction guard set in data from film studios, broadcasters and streaming amenities for latest generation of Ultra HD. Isolated amps supply high rapid current to surge speaker control for precise and lively audio reproduction. This detailed power is the keystone of Onkyo’s intensification philosophy. You are able to stream essentially any audio from your tablet, smartphone or PC to your home theatre for flawless and commanding sound. AccuEQ analyses and alters the output stages, crossover regularities, distances and frequency reactions from one swift and easy listening position to give the listener a pure and stable surround experience. You only need one wire! Every video signal is transformed and directed to your TV over one HDMI cable. The convenient STRM Case port provides control to the media players you wish to stream from. Keep up with your video subscription services and other programs streamed from the Internet.